Antiques challenge. Charles Hanson and Margie Cooper are halfway through their trip. They start in Melbourne, south Derbyshire, and head for an auction in Aylsham. Margie Cooper and Derbyshire man, auctioneer Charles Hanson. He is as excited as usual. Just as well Margie is in command of this 1959 Elva Courier. I would just change gear if I were you. I wouldn't... I would just gently caress the accelerator now, Margie. I was driving cars before you were even thought of. -You're not that old, are you? Look at me. Both experts started this road trip with £200 and a complete gearbox. After two auctions, Margie has increased her loot to £280.32. But Charles is stretching ahead. He has £496.46 to flash about on this leg. before ending their trip in Leicester. destined for an auction in the Norfolk town of Aylsham. namesake of the Antipodean city down under. The delightful Helen is on hand to help. I try to please everybody. I try to buy a bit of everything. -It's just awash with treasures, Helen. These are pretty, aren't they? but I spy a problem. -What a shame. Oh, I don't believe it. I was feeling so good and then I saw the instruments. -Her little harpsichord has been damaged. raised pink Triangle Mark for Royal Dux, but what a shame. Oh, no. I thought she was wearing a waistband. -She's been broken in half as well. Literally... Have you seen that? Her whole waist there has been off. Crack, crack, crack. They must be so cheap, Helen. They are very cheap. £20 for the pair. I'll think about them. Thanks, Helen. I'm going to wander on, OK? but will have one last scout around the shop first. -I might make an offer on are your damaged Dux figures. -Look at me, happy, she is happy. That's how hard it's been in Melbourne. Thanks a lot. Thank you. Despite the damage, these two figurines could do well at auction. Thanks, Helen. Take care. Bye. and the town of Castle Donington. Her first shop today is Once Removed. -Yeah, so, I'd love to have a look round. Sure, yes. Feel free to wander. Margie's got just over £280 to spend. What will she plump for? -That's been nice in its time, hasn't it? Margie's spotted an Edwardian ladies' toilet mirror. A nice bit of satinwood around here. Just turn it round to see what's going on at the back. It's as original, nothing been tampered with at all or changed. -Phil, I quite like that. -So, how much is that? -Well, that could be £25. I'm going to shake your hand on that. -Oh, right, thank you very much. One sale. You can wrap it then. One purchase already and Margie's still to explore Phil's basement. -I'm going to go down. Small but packed with stock. -Gosh, I've never, ever bought one in my life. -Yes, I can give you a demonstration if you want. Crank it up for you. And you've got the volume control there, you see. There you are. Volume control is shut the door. This 1920s gramophone comes with a few records, too. But what's the price, Phil? I'll go to 50. I could drop down to 50. -I'll have another browse upstairs. After another quick look upstairs, it's decision time. So I bought that, so do I just leave it at that and move on? Or do I have a crack at your record player? I think that's what we're down to. -40 quid won't buy it? £43. We're done. I'm on my way. for a total of £68. What's that little glass over there? Well, I think that's a French vase, 1950s-ish I think. -Yes, it's different, isn't it? -It looks very nice in the light. -How much would you throw that in for? so you could have that for a bargain £8. -Oh! I can't leave that, can I? £8. -Another £8. Great. Glad I spotted it. Right, so I'll give you some more money then. Oh, right, brilliant. There we are. Right. An impulse buy. A 1950s vase, a snip at just £8. the Derbyshire town of Matlock. This antiques centre has nearly 70 dealers. Come on, objects, talk to me. Having a hard time then, Charles? Can you go away, please? I'm struggling. and what I've found is pretty mundane to many eyes. and these lovely scroll volutes. So, many years ago, this piece of timber was very important. It probably formed part of a very elaborate Florentine frame. Sadly this is only a quarter of that frame and is priced at £65. it's that early. A really exciting find. It's all about the history in this. It's a great piece of timber. What I like about this box is it's no cheap, square box. with this star motif on top in ebony. I think it has got some age. traditionally made in that region of Tunbridge Wells. it ought to be about £75. so it's almost been missed. He always finds something interesting. so it's back up the stairs. Head honcho Lynne gets dealer Bernadette on the blower. I'll put him on, Bernadette. I just wondered, I'm just intrigued. ..I just quite like it because it's got some age. It came out the Brunswick Rooms in Whitby. Is that a Georgian building? It's a beautiful Georgian building. I will say, "Thank you very much." -So that for a tenner. The 18th century cornice and the rosewood box for a total of £58. -Take care. See you. Bye-bye. a few miles south of Derby. giving a snapshot of Victorian Britain like no other. one of the last traditional British upper-class families. The National Trust's Yanni Simpson is the assistant house manager. -You too. Welcome to Calke. to the country's economic strength and the largest empire in history. One such aristocratic family were wealthy landowners the Harpur-Crewes. to spend time and the family money on their natural history collection. -and it was designed as the main entrance hall to the house. -The bigger the room, the more money you've got. not as a social room but as a private museum. -Right, to house the collections. hunting trophies, but his son, Sir Vauncey, outdid his father. purchased from taxidermy dealers around the world. aristocrat, and proved detrimental to his relationship with his family. -So he didn't necessarily talk to his daughters. -..or he used an internal postal system. were hit by the financial crisis of the 1920s. by a 32% increase in the death tax. his wife and daughters were faced with a crippling tax bill. -..and Calke was not worth what the inheritance tax was. unable to pay for repairs. in lieu of an unpaid multi-million-pound tax bill. they found a stately home frozen in the 1920s. Everything you see you today is as we walked in in 1985.
and just simply pulled down to get rid of the family debt. preserved as a grand tribute to days gone by. And, with that, an exciting day on the road comes to a close. So nighty-night, you two lovebirds. Charles is behind the wheel this morning, so watch out. For Queen and country, Margie. an Edwardian toilet mirror and a 1950s glass vase. a Victorian rosewood box and an 18th-century carved cornice. But he struggled to find objects he really loved. "Look at me, come to me." First stop is in Kimberley, Nottinghamshire. Margie's shopping in one of the oldest streets in the town. Curiously, the chap in charge isn't called Alice. He goes by the name of Michael. Hello, Michael. I'm looking for some little, quirky smalls. -Yeah, shabby chic, yes. Go round here. -They're popular now, aren't they? People paint them as well. But, you know, there's something rather nice about them. It's a good idea to stick them in a bathroom if you paint them up. Paint them up and they look good, don't they? they were made for is out now. -It's all aluminium, isn't it? They won't be used as stepladders, they'll be displaying something. I mean, you know, people find them quite heavy, don't they? -Afraid I'm going to break it, Mike? -You're going to lose the sale. -You've got a lot to do today, still. but, as luck would have it, they're in the sale. and that's not cheap enough. So if you can sell me that for 15 quid, I'll buy it. -Right, well, there we go. 15. -OK, Mike, thanks very much indeed. Michael's been most kind and Margie has another item to take to auction. near to the village of Papplewick. the pumping equipment inside saved millions of lives. the forgotten hero of Nottingham. -Nice to meet you and welcome. -Great to hear. What a building. the best water engineer of the 19th century. -May we go for a wander indoors? a boom in textile industries, mining and engineering. Thousands left life in the country to seek work. Cities soon became overcrowded, and Nottingham was no exception. from 10,000 in the mid-18th century. that were built specifically to house them by speculative landlords. didn't even have a back door. It was an appalling way to live. 60% of children below five years old died. Overcrowding led to outbreaks of disease. One of the most feared was water-borne cholera. How was cholera getting into the system? water into the town to standpipes. Some into the houses. they drew in the contaminated waste in the ground. So people were actually infecting themselves by drinking the water. -And that obviously gave that low life expectancy. and, in some of the wards, 18.
suffering from illness would benefit from clean water. the leaky pipes and pumping a continuous supply of water. under pressure all the time to keep the contamination out. water, he was also stopping outbreaks of cholera. to a sceptical establishment, he faced stiff opposition. His revolutionary piece of engineering didn't come cheap. What did he say to get them on board? the consequences of people dying early. that had to be paid for by the town. -they would be able to pay more taxes. this steam-powered pumping station at Papplewick. to taps in people's homes. -It did. It did work extremely well. a cholera outbreak in the country. Nottingham didn't have any problems at all. Nobody died in Nottingham. Thousands died around the rest of the country. and his system was soon adopted by other cities. accelerated ahead of many others in the following decades. pumped up now on the Antiques Roadtrip. My pressure is increasing, Tony. and attempt to find my next few antique buys. Thank you for a wonderful visit. It's been really, really rewarding. a tribute to a man who saved millions of lives around the world. The final shop for both our experts is in Grantham, Lincolnshire. ..giving Margie first dibs at Notions Antiques Centre. -Good afternoon. How are you? Sharon, I should call like that. so I'm going to have a look around. Margie still has £189.32 to spend. What is she on to here? How does this work, Lewis? -Oh. That's quite unusual, actually. Yeah. A cigarette pops up. -You pop your cigarette in there, right? Pull that lever and it shoots the cigarette through the torpedo hole. if you've had to put it in in the first place? -..it shoots it straight into your mouth. as it may have been made by a soldier or a POW during the war. -I must say I quite like that. -Right, well, I mustn't linger. No. One to think about. Right, what's spinning round in here? Just have a look at this. What's this little chap here? Hey. This little wooden boot is a Victorian inkwell, priced at £52. It's very cute. It's got the original little bottle in. We've got a bit of damage. Oh, that's cute, isn't it? I quite like that. Margie seems to like it so that's her second possible. to make my mind up soon cos Charles Hanson is about to arrive. Lordy. Margie's on the move. Look at her shift. Oh, I can hear his car outside. -You don't want to ring her? Hurry up, Lewis. I hope that dealer's on speed dial. -28 you can have it. That'll do. -I've got the two in the bag. and just in time cos here comes Charles. -She is. She is. She's been. -She's not here now, is she? Margie Cooper's here? I know you're late. It's been terrific. I've had hours here. -Have you been a magpie around the entire...? -You're on your own, kid. Good luck, mate. See you. finished now that Hanson's in there, cos he causes chaos sometimes. Margie leaves Charles to it, with over £428 still in his pocket. It's always quite nice to begin at the bottom and work up. Follow me. Margie never found the basement. this teapot goes back to 1810.
beautifully painted in a whimsical, regency style. What's really nice is you get the teapot stand as well. Yeah, priced at just £12.50, it's one to leave to brew. and they're really quite sweet. This one I think could be Happy. How are you, Happy? They're quite nice. They're just weathered. But they're quite sweet. you need your mates with you to keep the Hansen line up and running. Hey, guys, you fancy coming to Norfolk with me? These seven chaps are priced at £49. With nothing else to tease him on this floor, Charles heads upstairs. That's nice. What we've got here is a very nice dish from circa 1810.
you'll see from the slightly bluish glaze, is a pearlware. This could appeal to collectors. Ticketed at £20, Charles is interested. I'll leave that down there. ..which has a plant in it, is it for sale? -How much is it? Is it yours? -Has it not got a price mark? -Let me give you that plant. -It's not wet, is it? This porcelain jardiniere is Japanese and is over 100 years old. Sharon and Lewis even have a stand to go with it. Oh, that's nice. I just need something which has a look. Indeed, a grand stand for a Japanese pot. .."Would you sell the two together," what would be your best price? I'm going to come to some decisions now, if that's OK with you, Sharon. -OK. Let me show you over here. -I brought this downstairs from your top floor. That's a nice dish. What would be the best on that? You wouldn't take ten for it, would you? Meet me halfway at 12? -Go on, I'll do it for 12. Sold one. We've got a deal. Thank you, Sharon. That's great. -So I've bought one thing. -In your cellar, there is a teapot and cover on stand. -May I just run and get it for you now very quickly? -I'll be back in ten seconds, OK? Count me in. -We're doing that for 12, aren't we? -8. So 20 for the two. I'll take that. That's one more down. What else have I seen? -I like the dwarves. Are they yours? I think they've been almost highlighted. Their colours are so flashy, aren't they? They're priced at £49 for seven. There we go. We're not hanging around, now. Bang, bang, bang. -What were we at, 75? -50 and our wagons roll. -If you're happy on that. Yes? -I'm happy and you know it. Clap your hands. Thanks a lot. Thank you so much. -Give us a kiss. Thanks very much. Charles has bought four items in as many minutes. and that brings our shopping to an end. and Staffordshire teapot into one lot. All that lot cost him £163. and a wooden cigarette dispenser. Like the look of the competition, guys? Margie's bought really well this time. they're wonderful objects, it's in a great case and that's a star buy. I think that stands out, that carved piece of wood. Probably 18th century. Gilded. I like it very much. in the attractive market town of Aylsham. Oh, it's a bit damp today. -I've got a wet leg. -I know. My leg's wet. I'm not sure what's happened, Margie. It's either the nerves or it's the rain. Not a good thought, that. institution, and they've been selling from here for well over 60 years. -This must be it, Margie. -The rain is ceasing, Margie. We're here. -I think there's two things. and also getting out here without a huge loss. -Oh. There. I'm out. Margie, stretch, be ready. Our auctioneer today is Dave Gould. What does he think will do well? The nice 20th-century oriental jardiniere and stand. 40-50, 40-60, that sort of area. Gramophone, again, they're great little cabinet. sort of anywhere in the area of sort of £30-£50 on that, realistically. Time now for Charles and Margie to take their seats. The first lot to go under Dave's gavel is Charles's seven gnomes. I've got to start these on commissions at £30 here. Come on, let's go. Come on. Let's go. Come on. -Come on, sell. One more. 35. One more. -They were cheap. Doesn't matter. Kicking off with a profit. Next up, Margie's Edwardian toilet mirror. Oh... What did he say that for? You're flying high, Margie. Doubled up. Margie Cooper, take a bow. All out now then at 50. That's the biggest profit of the day so far. Take a bow. We're only two lots in, Charles. But, yes, Margie's doubled her money. Charles's Japanese jardiniere and stand is up next. Who wants a jardiniere? Any bids? Any bids? I've got to start that one here at 35. Come on. I'm behind. Come on. Yes, over there. Sorry. Sorry. -Thank you very much, madam. -Away now then at 65. A strong profit for Charles. Well done. It's that stick again. Margie's stepladders are up now. Start this here at £15. Maiden bid with commissions and I'll sell away now at 15. -Got away with it. Got away with it. -That's good. £15. Broken even. It will be a small loss after commission, though. Charles loved the carved 18th-century cornice. How will it do? I've got to start this at £30 I'm bid. -Go on, sir. One more. -I'll sell them at 45. Someone's got a so-called 300-year-old cornice for a steal. The next lot is Margie's 1950s glass vase. £10 here for that at 10. 10? 10. At 12? 12. 15? At 15. 15. 18? At 18. Go on. At 18. 18. 18. It's in front. It goes now at 18. -That's good. Oh, that's great. It is. And Margie's slowly stretching ahead. Charles's next lot was supposed to be the pearlware plate and the teapot. However, the plate was broken during the auction viewing - a tragedy. Charles will still receive 45. Yeah, the teapot's great. OK. I'm still standing, Margie. -Very lovely, yeah. I love it. 20. Commission takes it away again. so Charles walks away with a £25 profit. No, I'm very happy with that. Helps me out. Helps a poor man out today. Now time for Margie's cigarette dispenser. I love this. This will do well. Maritime interest. You watch his move, Margie Cooper. Start me then at 10. 10, 12, 15. 18, 20? At 20. 2, do you want? 22. At 22. 22. 25. 25. 28. 28. 28, you're sure? -28. 28. With Nelson, away it goes now. Is that profit for you? If should have made about £70. It made Margie a few pounds' profit. Now it's the turn of Charles's Royal Dux figurines. -Unfortunately, a bit of damage. One hand been cut in half and glued together, but still a nice pair. -At 40. 40, 40, 40, 40. That's where we're stuck now then at £40. I'm delighted with that, Margie. I'm over the moon. Well done indeed. A cracking return. Next, Margie's Victorian ink well. -We'll start that at £10 here. 12, 15. At 15. 15, 18. -At 20. Lady takes a seat and you're all out? Away it goes, then, at 20. That was so cheap. That was so cheap! Will Charles have better luck with his piece of Victoriana? His rosewood box is up now. I'm going to start that here at £5 only. At 10. 12, 15? At 15. 18. 20. At 20. Well done, Charles. You're ending on a profit. -This gramophone is big, £43. -We must wind it up. I think it will wind them up. You watch. -Start this here at £35. Coming out in a hot flush! -Margie, you're the queen of the east. but is it enough to win this leg? Margie started off with £280.32. meaning she has £325.74 for next time. Charles started this leg with £496.46. to the next leg. Wow! -Pipped at the post, that's what I've been. -It was a funny old game today. It was high and low. The helter-skelter of the road trip. -You've got the luck of the Irish, you have. Until next time, then, bye-bye. You are Maid Marian. I can be your Robin Hood. ..but will it turn into a brawl? -Do you want me to make an offer for it? 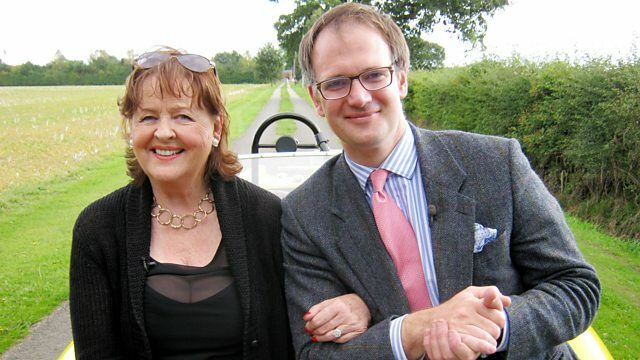 Auctioneer Charles Hanson and dealer Margie Cooper are halfway through their road trip. They start in Melbourne, south Derbyshire, and head for an auction in the Norfolk town of Aylsham.